One of the many pluses of Village by the Sea is its location next to the salt-water marshes that border Wells and Ogunquit. These marshes support extensive areas of relatively undisturbed habitat and a wide array of wildlife including a large number of rare plants and birds. The Wells and Ogunquit marshes are the second largest salt marsh complex in the state and are almost entirely under conservation management. When naming our condominium association and deciding how to identify our brand, we chose two of the common birds of the salt marsh and two common Maine field birds. Local marshes, local fields, local birds. 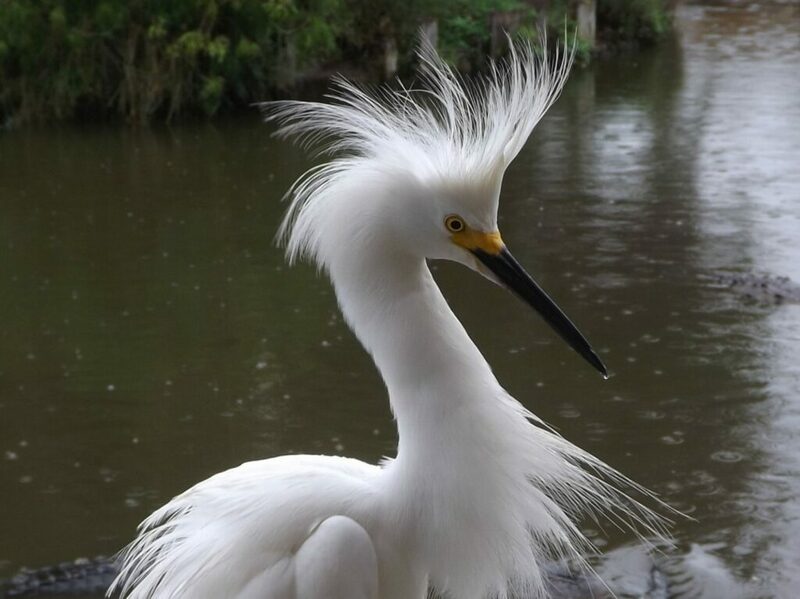 Our logo depicts the snowy egret, which is common throughout the salt marsh areas. 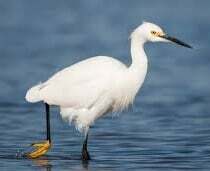 The snowy egret is a medium-sized white bird with a slender black bill, black legs, and yellow feet. The area of the upper bill, in front of the eyes, is yellow but turns red during the breeding season. These decorative plumes develop during the breeding season and were much favored for women’s hats in the late 1800s. By 1886, the plumes were valued at $32 per ounce, which was twice the price of gold at the time. Snowy egrets nest in colonies on thick vegetation in isolated places, such as barrier islands, salt marsh islands, swamps, and marshes. It eats mostly aquatic animals, including fish, frogs, worms, crustaceans, and insects. Egrets are very social and live with many other egrets and similar shorebirds. This cheerful, little bird (4-6 inches long) is the official state bird of Maine—and Massachusetts. The black-capped chickadee is omnivorous (eats both plants and animals). Caterpillars, spiders and other insects make up about half of their diet, while seeds and berries make up the rest. 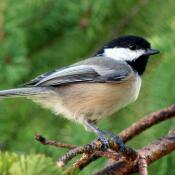 The chickadee “caches” its food. It hides seeds and berries in the crevices of tree bark and under leaves. Remarkably, it can remember where it has hidden its food for up to a month. A group of chickadees is often called a “banditry” of chickadees—probably due to its mask-like face. plumage — its grayish-white head and neck feathers become cinnamon in early spring as the birds begin to form pairs and migrate to breeding areas. 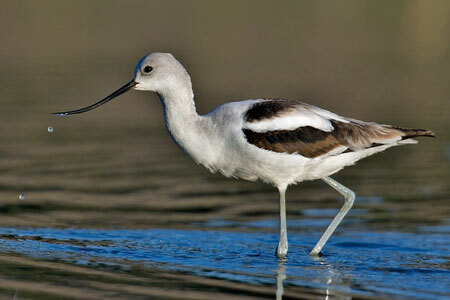 American Avocets normally raise only one brood per season. The chicks leave the nest within one day of hatching. 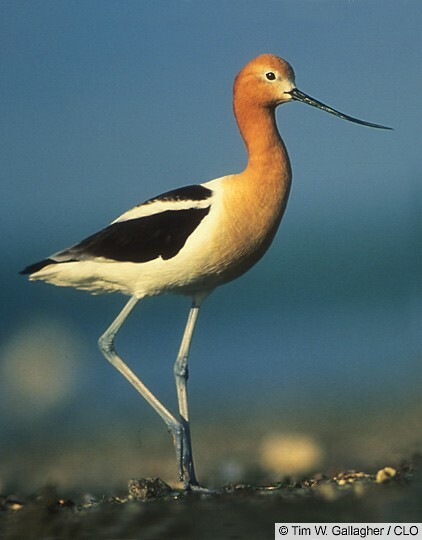 American Avocets feed by foraging in shallow water or along mud flats. They sweep their bills from side to side in search of prey that includes crustaceans and insects. Avocets are territorial animals and will aggressively protect their territory and chase away unwanted birds from their home range. They use distraction tactics, such as loud screeching, or a “dive bomb” display until the intruder turns away. Bobolinks are small blackbirds known for their bubbling songs and their striking black and white plumage (male). Once common in hay fields throughout the Northeast, Bobolinks have declined by over 2% a year between 1966 and 2015, resulting in a cumulative decline of 65%. The Maine population of Bobolinks has shrunk to 60,000. Their decline is primarily due to changes in farming practices. Many fields are now mowed earlier and more frequently than they were in the past. The first mowing of the year occurs shortly after the Bobolink chicks have hatched. Approximately 94% of hatchlings are killed during this first mowing. 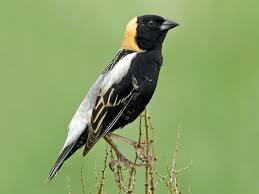 To improve the Bobolinks (and other grassland birds) odds of maturing various programs have been started (e.g., the Bobolink Project) to either pay farmers to delay mowing or to establish native grassland strips along their fields where these birds may breed. Bobolinks are polygynous, meaning each male mates with several females per breeding season. They are also polyandrous, which means that each female is sitting on eggs that may have been fertilized by multiple fathers. Each year Bobolinks make a 12,500 mile round trip flight from Maine to the pampas of southwestern Brazil and Argentina. During their lifetime, a Bobolink can travel over 100,000 miles—that’s equal 4 or 5 times around the Earth’s equator, or halfway to the Moon. A group of Bobolinks is called a chain. Want to see these birds up close? Stay with us at Village by the Sea. We are a year-round condominium hotel and conference center that offers one- and two-bedroom units located right in the heart of Wells, Maine. Our beautiful 11-acre resort offers a variety of amenities and is located close to a number of local restaurants, beaches, and other activities. If you’d like more information or you want to book a unit at Village by the Sea, please call one of our reservation agents at 1-800-444-8862 or make a reservation right here on our website. Having trouble using this site? Accessibility is our goal, please contact or email (reservations@vbts.com) us with site improvements.